The traditions of Indian dance and dance dramas are among the most perplexingly complex and varied theatrical cultures of the world. The geographical vastness, different ecological conditions, multiplicity of races and their languages, the complex religious beliefs and ritual practices and equally intricate social structure have all contributed in creating the most colorful panorama of dance and dance drama traditions. Among the neo classical dance and dance dramas like Bharatanatyam, Kathak, Kuchipudi, Odissi, Kathakali and a few more, Chau, the rare mask dances of eastern India are quite unique. It is difficult to ascertain the antiquity of these three major forms of Chau but surely this region, as noted by several ancient scriptures, was one of the most arduous areas to penetrate by an outsider. The thick forests and the hilly region inhabited by the "hostile tribals" made it impossible for anyone to trespass. The near paucity of written record or incomplete historical account compels us to accept some 'reconstructed' notes that mention about the local and a few Hindu chieftains who gradually established their sovereignty within the small pockets of this region after 12-14 century A.D. and slowly influenced the life and customs of the native tribals. Today layers of these influences accumulated over centuries are discernible in the cultural activities of these tribals. Today layers of these influences accumulated over centuries are discernible in the cultural activities of these tribals. The tribal belt where the tribals and other common people perform Chau dances is distributed into three adjoining states, Bengal, Bihar and Orissa, after the dissolution of the princely states in 1950. The three forms of Chau are named after the district or village where they are performed, i.e. the Purulia Chau of Bengal, the Seraikella Chau of Bihar and the Mayurbhanj Chau of Orissa. Surprisingly the earlier writers have exercised considerably to understand the origin of the word Chau and to ascertain its classical origin as also they have tried to establish the origin of the word Chau from Sanskrit root word ''Chaya'', while others have tried to justify its martial base and the derivation of the word by suggesting that the word Chau is derived from the local dialect meaning an army camp. However, they have overlooked the outcries of the performers or the drummers during performance. Particularly in Purulia, the singer drummer often rushes to the new characters "by shouting "cho... cho...cho..." with excitement, before they enter into the arena. By doing this he infuses the same enthusiasm in the dancer. During the course of the performance also such excitement and outburst of joy are expressed by the singers and other members of orchestra. Similarly this author heard the same utterances by the hunters who assemble at a particular hill top during the annual hunting expeditions on the full moon day in the month of May. While chasing the game exclaim they exclaim "cho... cho...cho..." (A broader pronunciation of Chau), in order to fright the animals or invoke the spirit of animal for easier gain of the game. Most likely it is this word associated with the natives' earliest hunting occupation that is now associated with their dances to express joy and excitement. Due to lack of sustained patronage and guidance, Purulia Chau show very little evolvement since its hunting or warfare origin. Performed by the early inhabitants of this arid region, it is almost an antithesis of sophisticated and stylized Seraikella form. Brief and simple rituals precede the dance performed that is conducted in front of a Shiva temple or the village square. The village head is the patron and he carries a brass pitcher on his head to his house where his wife sprinkles the water of the pitcher on the newly harvested crop. Later, in the month, around 14th of May more elaborate rituals are offered to the sun god. Many devotees observe austerities including piercing their bodies with iron hook. On a high poll they are suspended and whirled round on 'chadak' to suggest the progression of the sun in different constellations throughout the year. Till the early decades of this century these dancers and the form were patronized by the Bagmundi ruler, but due to unproductive land and ever failing rains the ruler could hardly provide necessary support. The performers too were forced to migrate to nearby urban city like Calcutta in search of living. Since 1961, when this form was first witnessed by an anthropologist in a remote village of Purulia district and their subsequent visits in major cities world over, the locals have formed their own 'parties' in anticipation of a sponsored trip abroad. They have added more 'exciting' combat scenes with more skillful pirouettes and summersault. The costumes specially the headgears have acquired enormous size and jazzy decorations. Influenced by the more respected Hindu culture the natives adopted the epical themes but they naturally opted for the warfare scenes that would reflect their life of perpetual hardships and conflict with nature itself. Even the characters the noble and heroic characters like Rama and Sita are depicted with forceful gestures. During the festival time a special flask shaped dancing arena is prepared where several dancing 'parties' assemble to perform. Two or more 'dhamsa' or kettle drum players and equal or number of drummers accompany the groups. The tune is provided by a Bo like wind instrument called Marui. Unlike Seraikella Chau here the chief drummer sings the introductory song or renders rhythmic passages during the performance. After introduction of a heroic character when he enters the arena he runs to and fro several times in the narrow passage before commencing his dance or dialogue with other characters. On the other hand a demonic character takes several vigorous turns or summersaults and turns to sections of spectators for recognition and applause for his skill and virility. Such skillful acrobatic feats proliferate every year leaving the researcher completely amused for their innovative skills in improvising such exciting sequences. As you enter Chorida, a small village in Purulia district during Chau season, the village that provides some of the best masks, practically every house and every member of the household is seen occupied in making masks or assembling decorations for headgears. The process of making mask is nearly the same; however, due to thick layers of clay, paper and mud these masks are heavier than the Seraikella masks. Moreover the eyes on these masks are wide open, although the air passage of nostrils is very narrow. The demonic nature of a character is ascertained by the knitted eyebrows and thick hair growth on the face by pasting jute fibers. Thus the variety of masks in this form is equally or more varied than the Seraikella masks even though the thematic content is limited to epical stories. Chhau seems to be a generic name of a group of stylistically varying dances. It ranges from simple folk to highly evolved styles. All these styles of dances are called Chhau. To distinguish one from the other the use of an epithet has now become inevitable. The three most representative styles of chhau have as their epithets the names of the places where they developed under the patronage of the respective feudal nobility. They are known as Seraikelaa Chhau, Mayurbhanj Chhau, and Purulia Chhau, and the degree of sophistication which they acquired in the feudal courts is in that descending order. Although they differ stylistically from one another, they have many similarities. The most important and significant similarity is that they are called simply by the generic name: Chhau. We have given the epithets for our convenience. A generic name usually points to the root character of the class it denotes. The character, even after any degree of evolvement, remains an integral part of the class either overtly or as an underlying base. And if various styles of dances known as chhau are analyzed, it is found that they all have martial strains. The word 'chhau', now obsolete, means to attack stealthily. The basic steps and gaits of Seraikelaa and Mayurbhanj styles of chhau not only are practiced holding a sword and a shield, the rudimentary dance are known as ruk-maar-naaclia (meaning the dance of attack and defense) in Mayurbhanj and phari-khandaa-khela (meaning the play with the sword and shield) in Seraikelaa. In Asanapaat, a village in Orissa one can find a dance called paaikaali, that is unmistakably the mother of chhau because the leg extensions are exactly like that of chhau and they perform a kind of attack and defense dance almost like ruk-maar-naacha. The musical instruments used in paaikaali are exactly the same as those of chhau. In Orissa the soldiers were being called paaika-s. 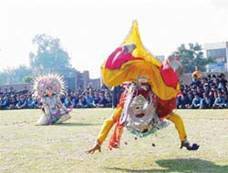 Therefore, chhau in its origin was unmistakably a weapon-dance or a war dance. Even the use of masks in Seraikelaa Chhau and Purulia Chhau, and in their less evolved folk versions, does not disprove the assumption, but rather strengthens it. Otto Bihalji-merin in his Mask of the World writes, "A mask dance is often preliminary for war. The dancers portray in pantomime the actions they plan, sneaking up to the enemy, javelin throwing, close combat and finally victory. This serves as a magic spell, as physical exercise, as spiritual preparation, and at the same time as conquest of fear through the anticipation of victory. The helmets of classical antiquity were also masks of fear and magical protection. Greek helmets had fixed visors with eyeholes. During the bloody gladiatorial combats in the Roman arenas the swordsman (hoplomachus) confronted with the net man (retiarius) wore a helmet a wire-netting visor to protect his face." Various aspects of life into a unified whole. Therefore in primitive culture everything concerning life beginning from eating and drinking to fighting a war has religious association. A very marked similarity is found in the music that accompanies the various styles of chhau. The percussion is both powerful and dominating and is shared by a variety of drums of which Dhol and Dhumsaa (also called dhaak) are most essential. The embellishment provided by a short cylindrical drum called Chadchadi and a small hemispherical drum called Tikraa, are sometimes dispensed with in some of the styles of chhau. Again, between Dhol and Dhumsaa, the former leads. Dhol is virtually the kingpin of a chhau performance. It not only fills the dancer with rhythmic inspiration but also is the main weaver of the fascinating percussive tapestry of chhau music. While Dhol gives the character to chhau music, the powerful, reverberating beats of Dhumsaa underlines its virile personality. If the three styles of chhau are closely examined it would be revealed that they are as much forms of dancing as forms of theatre. Of course, through dance movements, they narrate the story or theme contained in each number, yet the overpowering theatricality is unmistakable. According to Brecht, the great theatre thinker and playwright of Germany, who has profoundly influenced the contemporary theatre directors and actors, the main business of theatre is the exposition of the story and its communication by suitable means of alienation. Elegant movements coupled with graceful groupings have enough potentiality to alienate and inventive miming greatly helps in exposing and communicating the story. Viewed from this Brechtian angle chhau is primarily a form of theatre in which dancing is the most dominant means of alienation, like that of Kathakali. From the perspective of Indian aesthetics, Brechtlan alienation comes very close to the naatyadharmee style of presentation. Both the terms mean the depiction of an event in a non-realistic and unfamiliar light intended to dissuade the spectator from identifying himself with any of the dramatic personae and to induce him to regard the event of the performance with critical detachment. If a spectator is identified with the character he will go through the same emotional experience which is likely to cloud his sensibility. The purpose of this 'detachment' is, however, different. While the naatyadharmee presentation aims at giving a taste of rasa, the aesthetic relish, and the Brechtian alienation aims at pure intellectual awareness. Even if the Indian view were taken into chhau, like Kathakali, would fall under the category of naatya than nritya. Chhau then, in a sense is a form of traditional Indian dance-theatre. In this form of theatre the actors express themselves in movement, not in words. Therefore, all the three styles of chhau have the character of a non-verbal dance-theatre. Each of the three styles of chhau has its own scheme of stylization so that the characteristic movements become adequately expressive to carry the theme dramatically. The most marked difference among the three styles is in the use of mask. 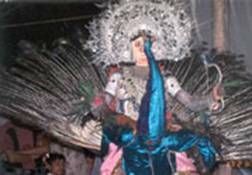 The Seraikelaa and Purulia styles of chhau use masks whereas Mayurbhanj Chhau uses none. Again, masks used in Seraikelaa Chhau have a totally different function and stylization to those of Purulia Chhau. The use of mask in Seraikelaa Chhau not only determined its growth but also remained its focal point. The masks of Seraikelaa Chhau are more sophisticated in both concept and design than the masks of Purulia Chhau. The uniqueness of Seraikelaa Chhau is that these neutralized masks become expressive during the course of dance. The same mask with different modes of stance, gestures, and positioning of the body may, at times express great anguish and at another time joy and happiness. The masks of Purulia Chhau, on the other hand, vibrate with a quality of earthiness and their function is mainly to heighten the theatricality. The masks are invariably integrated with towering headgear that gives them a resplendent touch. These masks give the larger-than-life mythological characters a fascinating palpability. Without masks Mayurbhanj Chhau dancer and actors have more freedom for movement. 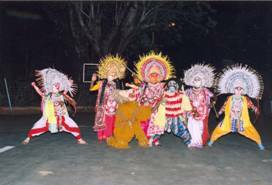 Therefore, Mayurbhanj Chhau excels in choreography, especially during group numbers. In this style of chhau the movements alone become visual poetry. Since all the chhau dances, ranging from the simple folk to highly evolved, belong to the same family, each should have love and appreciation for the other styles and not a feeling of superiority over others. Each style has its own charm and aesthetic appeal. They are all fascinating in their own way and together they amply enrich the performing art heritage of this country.